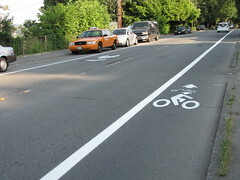 It looks like the restriping on 15th Avenue South north of Spokane Street has finally happened. The new right-turn lane at Spokane when heading southbound is much nicer than the old “squeeze into the de facto turn lane that isn’t really a lane, and hope you have room to make the turn” situation that used to be there. The new bike lane is nice, too. The parking situation has changed a bit, though. If you live, drive, or ride on 15th, how are you handling it? New bike lane and sharrows on 15th Avenue South, just north of South Atlantic Street. Photo by Jason. 15th Avenue South at the north tip of Beacon Hill has been restriped, with a bike lane added to one side of the street and sharrows to the other side. This part of 15th tends to have drivers who drive excessively fast. Cyclists, remember the bike lane doesn’t guarantee your safety, so please be careful out there; drivers, please watch out for cyclists both here on 15th and elsewhere on the hill, and remember that it is illegal to drive in the bike lane. Google Maps shows this area as it was until recently.